Before I get into today's System Shock article, which comes straight from the pages of my upcoming Pathfinder project, Aspects of Axis, I thought I'd poll you readers about what you might like to see in upcoming Encounter Table articles. I've had some requests come in by email for the Mass Effect races to be represented in Pathfinder using the system built into the Advanced Race Guide. I've also had more than a few people ask me to stat up some of the races from Guild Wars 2 in the same vein. What would you be interested in seeing from a Pop Creature article? Additionally, are there any kinds of Pathfinder game subsystems or new rules you'd like to see addressed? Leave your thoughts in the comments below, or shoot me an email and let me know what you think. Today's System Shock article can be found, along with some of the new inevitables mentioned in its text, in the upcoming Aspects of Axis. The Knight of Axis is a pretige class themed directly off of the Hellknight prestige class found in Pathfinder's Inner Sea World Guide. The Knight of Axis was developed from an in-game notion that perhaps the Hellknights weren't the original practitioners of their craft, and that the founder of the Hellknights may have based his teachings on an older, different order. After the jump, that hypothetical organization of knights in service to Axis' laws is presented. It mirrors the same framework of the Hellknight prestige class, but its abilities are less diabolically themed. Let me know what you think about this preview in the comments! When the planes were still young, when the first war between law and chaos had only just come to a close and the fires of that great conflagration still burned as embers the Godmind of the axiomites urged the spread of lawful teachings and traditions beyond the boundaries of the great beyond. Scholars and sages of the axiomites that survived the war made migrations to terrestrial worlds on the material plane, bringing with them knowledge of mathematics, laws and great eldritch teachings. Among the cultures visited over the countless thousands of years that these scholars traversed the material plane was the once mighty Jistkan Imperium that dominated the Inner Sea region of Golarion following the conclusion of the age of darkness. Among the secrets bestowed upon the Jistkans was mathematics and knowledge of how to create great feats of engineering, feats that would persist into present-day as the legacy of the Jistkans in their numerals and constructs that persisted in function even after their empire collapsed. One tradition upheld by the descendants of the Jistkans was a monastic enclave of knights trained to combat the forces of chaos and uphold the codified laws of the Imperium. After the fall of the Imperium, these teachings and doctrines were rediscovered and twisted to become the foundation of the Hellknights. There are still those who uphold the old ways, though, old souls who continue the traditions of the Knights of Axis founded in the ancient Imperium, and any claim they may make about being the foundations upon which the Hellknights’ brutal training was based are dismissed as delusions of a bygone era. Despite this, isolated monasteries still teach the way of the Knights of Axis, knowing that one day crusaders of law not twisted by the hierarchies of Hell will be needed to defend the very fabric of reality itself. Or, so they were told. To qualify to become a Knight of Axis, a character must fulfill all of the following criteria. Armor Proficiency: Must be proficient with heavy armor. Special: You must sign a contract swearing allegiance to the forces of law, binding your soul to Axis in the afterlife. This contract signing must be witnessed by a Knight of Axis or an Inevitable. The Knight of Axis’ class skills (and the key ability for each skill) are Diplomacy (Cha), Knowledge (local) (Int), Knowledge (planes) (Int), Ride (Dex), and Sense Motive (Wis). The following are all class features of the Knight of Axis. Weapon and Armor Proficiency: Knights of Axis gain no proficiency with any weapon or armor. Aura of Law (Ex): The power of a Knight of Axis’ aura of law (see the detect evil spell) is equal to his total character level. Detect Chaos (Sp): This ability functions like a paladin’s detect evil ability, save that it detects chaos. Caste: A character must choose one Inevitable to emulate (see below for a list of inevitables). The choice of inevitable determines which disciplines the character gains access to. In addition, a Knight of Axis gains an additional class skill dependent on his choice of inevitable. Smite Chaos (Su): This ability functions as the paladin’s smite evil ability, but against chaotic-aligned creatures. This ability is twice as effective against outsiders with the chaotic subtype, chaotic-aligned aberrations and fey. If a character has smite chaos from another source, they stack for purposes of uses per day. Discern Lies (Sp): At 2nd level, a Knight of Axis can use discern lies as a spell-like ability a number of times per day equal to 3 plus his Charisma modifier. His caster level equals his total character level. Inevitable Armor (Ex): At 2nd level, a Knight of Axis earns the right to wear Inevitable Armor (see below). While wearing this armor, the Knight of Axis reduces the armor check penalty by 1, increases the maximum Dexterity bonus allowed by 1, and moves at full speed. At 5th level, these adjustments increase to 2. At 8th level, these adjustments increase to 3. Disciplines: A 3rd-level Knight of Axis gains access to his first discipline, choosing one that is associated with his specific Inevitable. At 6th level, the Knight of Axis gains a second discipline, chosen from any listed as being available to “any inevitable.” At 9th level, the Knight of Axis gains his third discipline, choosing this one from any of the disciplines listed below, even those not from the inevitable he chose to emulate. When applicable, the save DC to resist a discipline’s effect is equal to DC 10 + the Knight of Axis’ level + the Knight of Axis’ Charisma modifier. The Knight of Axis can use any one discipline a number of times per day equal to the total number of disciplines he has access to, so at 3rd level he may use both disciplines twice per day each. At 9th level, he may use all three of his disciplines three times per day. Brand (Sp; Kolyarut): The Knight of Axis can use mark of justice as a spell-like ability. Vigilance (Ex; Arbiter): When the Knight of Axis uses smite chaos on a creature he can sense the creature’s general direction at any distance and pinpoint its exact location if within 10 feet. For the duration of the Knight of Axis’ smite chaos, its target cannot catch the Knight of Axis flat-footed as long as he is conscious. Inevitable (Ex; Any): This ability allows the Knight of Axis to gain the Inevitable subdomain. The Knight of Axis gains all of the granted powers (but not domain spells) of that domain, treating his Knight of Axis levels as cleric levels to determine what abilities he has access to. Life Sense (Sp; Marut): The Knight of Axis can use deathwatch as a spell-like ability. Summon Inevitable (Sp; Any) The Knight of Axis may use summon monster V as a spell-like ability to summon 1 arbiter inevitableB2 with the advanced creature simple template. At 7th level, this spell-like ability is replaced by summon monster VI, allowing him to summon 1d3 advanced arbiter inevitables or 1 fidearutAoA inevitable. And at 10th-level, this spell-like ability is replaced by summon monster VIII, allowing him to summon 1d4+1 advanced arbiter inevitables, 1d3 fidearut inevitable, or 1 zelekhut inevitable. Deceleration (Su; Aevarut): When the Knight of Axis uses smite chaos on a creature, he can decelerate it to half normal speed. The creature can negate this effect with a Will save; otherwise, it is affected as if by a slow spell for 1d4 rounds. Elemental Arms (Su; Lhaksharut): As a standard action the Knight of Axis can grant the flaming, frost, shock, or corrosiveUE weapon enhancements to a melee weapon he is wielding for 1 round per class level. Quarry (Sp; Zelekhut): The Knight of Axis gains locate creature as a spell-like ability, except that this spell only functions on chaotic-aligned creatures. Force of Will (Ex): At 3rd level, a Knight of Axis gains a +2 bonus on Will saves against spells with one of the following descriptors: char, compulsion, glamer, fear, figment, pattern or phantasm. At 6th level, the Knight of Axis choses another subschool or descriptor to gain a +2 bonus on his Will save against, and the bonus provided by his first selection increases to +4. At 9th level, he chooses from the list again, and both previous selections increase by +2, so that he has a +6, a +4. and a +2 bonus, respectively, against three different effects. Bound to Axis (Ex): At 7th level, a Knight of Axis’ attacks are treated as lawful for overcoming damage reduction. Inevitable Embodiment (Su): As long as he wears inevitable armor, a 9th-level Knight of Axis gains a +2 bonus on all Charisma-related checks made while interacting with lawful creatures. In addition, he gains the ability to see perfectly in darkness of any kind, and gains 25% fortification against critical hits. Axis’ Knight (Su): At 10th level, a Knight of Axis can grant any weapon he wields or touches the axiomatic or keen quality. This weapon maintains this new quality as long as the Knight of Axis remains within 100 feet of the weapon—a Knight of Axis may maintain only a single weapon’s granted quality at a time. The Knight of Axis also gains 50% fortification against critical hits and becomes immune to nonlethal damage while wearing his Inevitable armor. Each sect of the Knights of Axis venerated and embodied the tasks and disciplines of a specific brand of Inevitable. While many more likely existed, the below inevitables are the only ones known to be emulated in the current era. Arbiter (Any one knowledge skill): Knights of Axis among the arbiter caste serve as advisors and scouts, relaying important information to the leadership of the Knights of Axis or officials that would benefit from correspondence or intelligence. The armor of an arbiter caste Knight of Axis is typically bronzed with wing decorations at the shoulders and an eye emblazoned on the breastplate. Fidearut (Perception): The fidearut caste concerns itself with matters of honor and codes of combat and conduct during wartime. They hunt down war criminals and those who cheat at important competitions or tests of strength and mettle. The armor of a fidearut caste resembles samurai armor in shades of green and bare metal. Zelekhut (Survival): Among the Knights of Axis, the zelekhut caste are relentless pursuers of fugitives and criminals across all borders and nations. These restless knights journey hundreds, sometimes thousands of miles to put lawbreakers behind bars or to the sword. The armor of a zelekhut caste inevitable is white-washed with gold trim and feature a pair of rampant pegasus on the breastplate. Marut (Knowledge (religion)): The marut caste are hunters of the dead, primarily, concerning themselves with the undying and other mockeries of life. Unending in their quest to expunge these offenders to the natural cycle and punish those who unnaturally attempt to extend their through other means as well. Marut caste armor is jet black and trimmed with bronze and gold with lightning bolt etchings on the gauntlets. Lhaksharut (Knowledge (planes)): The Worldwound seems to draw members of the Lhaksharut caste to it like moths to a flame. Spurred on by the incursion of the Abyss into the material plane, these servants of Axis seek to separate the link between the planes. Other, less ambitious, members of this caste concern themselves with smaller planar incursions. Lhaksharut caste armor is cobalt blue and accented with copper hues and is inset with colorful gemstones in concentric rings on the breastplate in stylistic impression of an orrery. 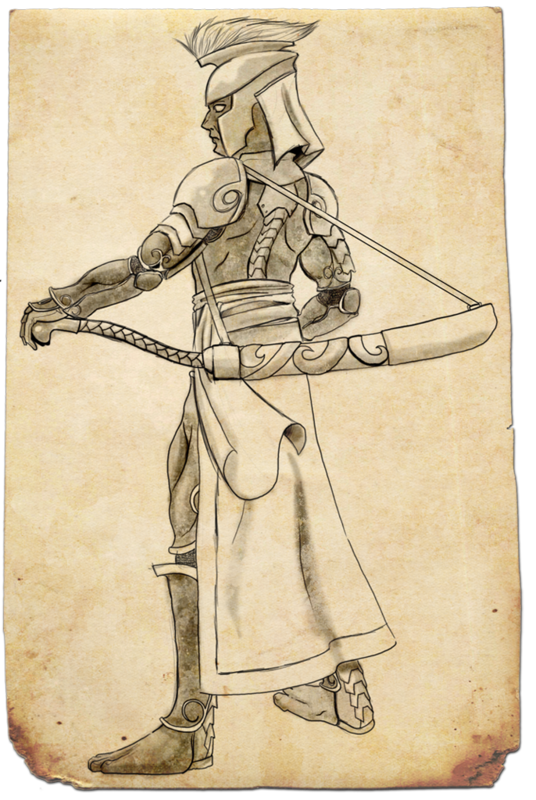 Aevarut (Knowledge (arcana)): Knights of Axis that seek to emulate the mythic aevaruts are rare, but these singular champions seek out instances of temporal instability or interlopers from other times or dimensions. While threats of this nature are rare, rumors of Runelords awakening from temporal stasis and threats of similar, ancient nature are of concern to this caste as they protect the material world from threats that originate from lost eras, regardless of their means of arrival to this one. The armor of the aevarut caste is snow white and gold with a six-eyed helm and a spider motif. These distinctive suits of armor are a special type of masterwork full plate that, when worn by a character with levels in the Knight of Axis prestige class, grants additional effects.